132 p., 15,5 x 23,0 cm. With contributions by Christoph Hennig, Lars Leeten, Guido Löhrer, Konrad Lotter, Hartmut von Sass and Sven Walter. 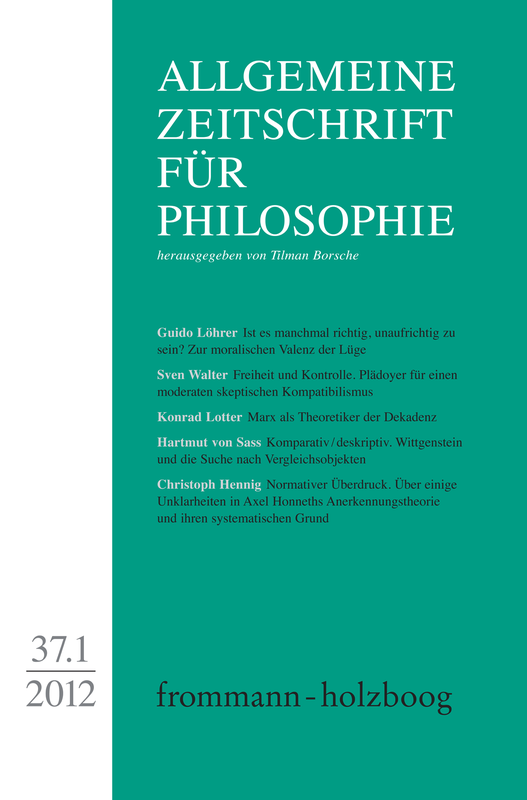 The Allgemeine Zeitschrift für Philosophie began the 2012 volume with an issue on subjects which dealt mainly with practical philosophy. Based on the question of the conditions under which a lie may possibly seem justified, Guido Löhrer shows that moral issues can hardly be decided by typologies of action with a constant valency assignment but in each case require the consideration and the assessment of aspects of the action. Sven Walter resumes the debate on freedom and determinism and, based on socio-psychological findings among other things, advocates a modern skeptical compatibilism. Konrad Lotter takes a new look at Marx’s philosophy of history and discovers a theoretician of decadence avant la lettre. Hartmut von Sass discusses comparative methods as a particular mode of description in Wittgenstein’s late philosophy. Christoph Hennig deals with some ambiguities in Axel Honneth‘s theory of recognition and its systematic basis. Lars Leeten criticizes Honneth’s »Recht der Freiheit« (Freedom’s Right).